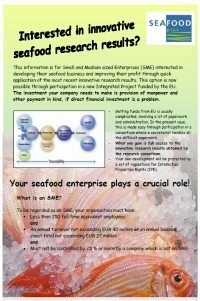 Involvement of Small and Medium sized Enterprises (SME's) in SEAFOODplus is essential. The SME's selected for direct participation are all innovative and RTD oriented companies that are willing to be involved in research activities and are able to rapidly pick up research results and implement these in their basic operations. In this way optimal conditions for knowledge transfer and implementation of results are guaranteed. This will benefit their businesses as such, as well as the development of seafood production and supply of healthy seafood to European consumers, thus contributing to novelty within the area. Should there be more SME's wanting to join the consortium, the invitation is open to do so. Please read the brochure below and fill in the form below for potential participation. Please also observe the possibility of establishing contact as an Associate of SEAFOODplus. Further, SMEs are invited to participate in demonstration projects. Please see details at ITD 3 or in news section. SMEs interested in participating in SEAFOODplus are kindly requested to fill in the SME profile form below. When the form has been filled in, it will automatically be stored in the SEAFOODplus SME database, managed by Begoña Pérez-Villarreal, Director of Business, AZTI-Food Research Division, Spain and Coordinator of SME involvement in SEAFOODplus. I AGREE TO PUBLICATION OF MY DATA. SEAFOODplus is a 4,5 year integrated project co-funded by the EU with the strategic objective of reducing health problems and increasing well-being among European consumers by applying the benefits obtained through the consumption of high quality seafood products.